'Rosecrest', the Morgan J. O'Brien residence in Hampton Bays. O'Brien would eventually leave 'Rosecrest' for 'Villa Mille Fiori' in Southampton. Click HERE and HERE for more on 'Villa Mille Fiori'. 'Rosecrest' is no longer extant. I like the look of this house ... although a little landscaping would have helped. Also interesting to see Mr. O'Brien's transition from comfort to splendor. "Rosecrest, c. 1910. 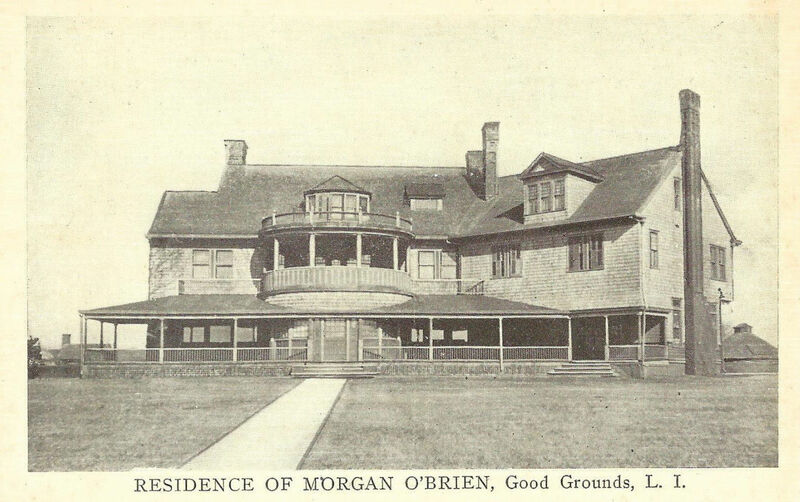 The summer residence of Judge J. Morgan O'Brien was located along Wells Creek, not far from the Ponquogue Lighthouse, and was built before 1894... 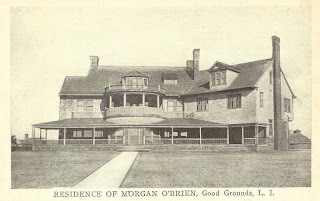 The large shingled mansion was eventually traded by O'Brien to Albert E. Boardman for his property Villa Mille Fiore, located on Great Plains Road in Southampton. Rosecrest was then donated, in 1921, to the Dominican Sisters of the Sick and Poor of the Convent of the Immaculate Conception on Sixty-second Street in New York City to be used as a retreat center... By 1960, the mansion had been condemned, and only part of the once grand home was salvaged and moved to another part of the estate grounds. This portion was standing as late as the early 1980s." Thanks Zach -- that house looks more like a theme park than a private residence. I like the way they interrupted the natural [looking] shore line to make room for a gargantuan swimming pool. & they already want to sell -- go figure. Regarding the Kings Park mansion, does anyone know who the original owner was? They say built in 1928.